Powder coating is an advanced method of applying a free-flowing and dry powder on the substrate without solvent requirement. The powder is charged and adhere on the grounded surface until it is heated and fused into a form coating layer in the curing oven. The finished coating gives uniform, durable and attractive appearance surface. WHAT ARE THE ADVANTAGES OF POWDER COATINGS? 99% used powder is recyclable. Giving superior coating film properties. A wide range of colors and surface effects is available. Easy performance without much technical skill requirement. VOCs free & Environmentally friendly. Curing time is much shorter than ever. ARE POWDER COATINGS CLASSIFIED AS DANGEROUS GOODS? Dangerous Goods are the articles or substances which are capable of posing a significant threat to health, safety, property or the environment and which are classified as per the IATA Dangerous Goods Regulations. Powder Coatings are not classified as dangerous goods. There are no solvents in powder coatings which simplifies the transport and storage of powder coatings. In the home appliance industry, powder coatings are well recognized as being a high quality finish for both major and minor applications. In the appliance finishing industry, the Advantages of high corrosion resistance with single coat application has resulted in powder coatings being used on a wide variety of electrical appliances, including; air conditioners, clothes dryers, cookers, dishwashers, fans, freezers, microwave ovens, rice cookers, refrigerators, stereo components, television components, video components, washing machines, water coolers. In addition to the major appliances noted powder coatings are also widely used for smaller appliances such as toasters, irons, can openers, juice extractors, food processors, vacuum cleaners and floor polishers. Although powder coatings are not yet widely used on auto bodies, they are finding growing applications on components for both interior and exterior applications. Current applications in the automotive industry include: air filter housing, alloy road wheels, brake calipers & components, bright trim molding, bumper bars, door handles engine blocks-iron & alloy, mirror housings, motorcycle frames, oil filter housings, rocker covers, seat frames, steel wheels assemblies, stereo system, components suspension systems, underbody primer, windscreen wipers. Powder coatings have developed a strong position in the architectural industry as a coating for aluminum profile, cladding and other building components. Computer casings, computer components, encapsulation, telecommunications equipments. 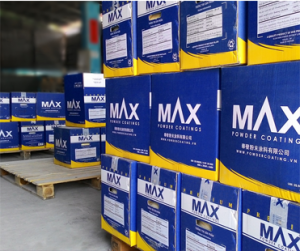 The applications of Powder coatings are continuously being expanded nowaday, it is easy to find some specific powder for UV cured, MDF or non-metal substances before long. Various special coating effects and properties are being developed rapidly and might comes to serve the industry very soon ie. Stainless steel like, Super high heat resistance, etc.